Overview. There are some basic skills and abilities that your salespeople need to have and continuously develop in order to become a successful sales team. Please view the following set of basic selling skills and abilities. Listening. A communication ability to hear what customers say. Asking Right Questions. A skill to choose the right type of questions (opening, closing, alternative questions) in a given moment within communication with a customer. Problem Solving. A set of abilities to help your customer choose a solution and provide some effective suggestions. Analytics. 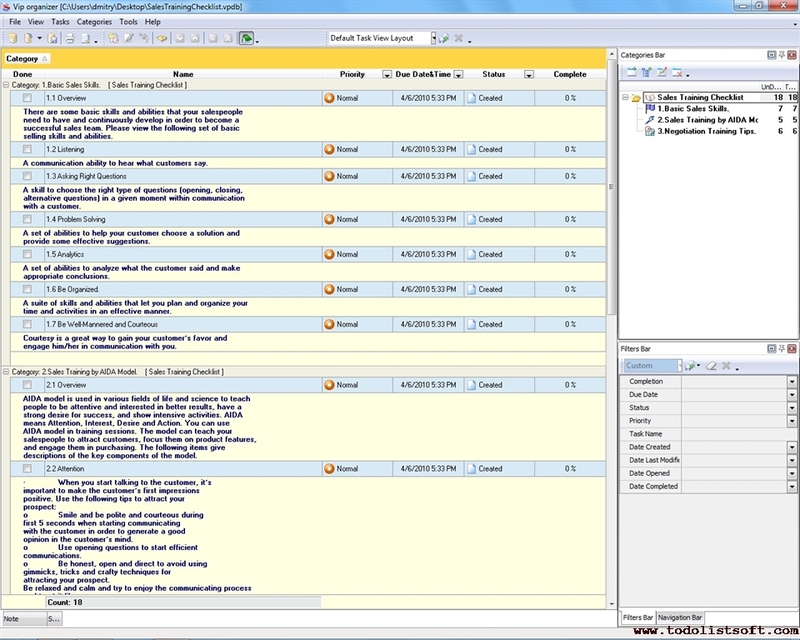 A set of abilities to analyze what the customer said and make appropriate conclusions. Be Organized. A suite of skills and abilities that let you plan and organize your time and activities in an effective manner. Be Well-Mannered and Courteous. Courtesy is a great way to gain your customer’s favor and engage him/her in communication with you. Sales Coaching by AIDA Model. Overview. AIDA model is used in various fields of life and science to teach people to be attentive and interested in better results, have a strong desire for success, and show intensive activities. AIDA means Attention, Interest, Desire and Action. You can use AIDA model in training sessions. The model can teach your salespeople to attract customers, focus them on product features, and engage them in purchasing. The following items give descriptions of the key components of the model. Smile and be polite and courteous during first 5 seconds when starting communicating with the customer in order to generate a good opinion in the customer’s mind. Use opening questions to start efficient communications. Be honest, open and direct to avoid using gimmicks, tricks and crafty techniques for attracting your prospect. Be relaxed and calm and try to enjoy the communicating process and treat it like a game. Use strong words and phrases that have the greatest impact on the customer during first 30 seconds of the communication. Ensure the customer that the product/service you’re offering is relevant to the customer’s needs and expectations. Demonstrate the product’s/service’s features and engage your prospect in actively using or testing it. Use only simple and understandable terms when describing the product/service. Never let your customer to lose his/her interest in the product/service. Establish trustful rapport with the customer to dispel any fears or doubts about the product/service before the customer truly desires to buy this product/service. Use both social and economic proofs to convince the customer of the product’s/service’s benefits and show how others like to use this product/service. Describe the customer how the product/service will help solve certain problems. Focus the customer on scarcity and point out that the product/service is available today only and perhaps tomorrow/next week/next month/etc. this product/service will be unavailable or available at different (higher) prices and other (worse) delivery conditions. Make a summary of the product/service you’re offering and make sure the customer understands everything right. Use closing questions to "push" your customer to the right answer. Ask if the customer wants to get additional advice or further assistance. Overview. Strong negotiation skills help a salesperson to be always ready for communication with customers and discuss a product/service. Negotiation coaching is not an alternative to AIDA model (or other similar models) but it supplements this sales training model and helps you foster good communication abilities. Please consider the following suggestions on this point. Always Have an Alternative. During negotiations with your customer it may happen that the customer tries to compare your product to your competitor’s product that has more features and advantages. You should be ready for such a situation and know how to respond to it. Having an alternative means providing the customer with your unique solutions that are alternative to any solutions of your competitor. You need to convince the customer that your solutions are better because they have some unique features. Commit the Customer to a Deal and then Continue Negotiating. One of the greatest mistakes of people involved sales negotiations is that customers are allowed to discuss further terms without giving any commitment. You shouldn’t let this happen. You’ll need to make your customer commit to your deal in order to secure this deal and engage the customer in further discussions. Remember that making more concessions to your prospect disarms you and reduces the probability of success. Reach for the Best Possible Result. It’s critical to set yourself up for the best possible outcome of sales negotiations. For example, if you have a sales target of 10 product units you need to start negotiations with 20 units. In such a way you increase your chance to sell more and get better results. Determine Requirements of Your Customer. Before you can get into sales negotiations you need to determine what your prospect requires, including both emotional and personal aspects. Because everything has a cost there are factors that can force your customer to buy your product. For example, if you know that your prospect wants to get a discount you need to give this discount. Product color, size, delivery time, coaching and support, warranty etc. are examples of requirements that you should take into account when planning for efficient negotiations.